the accuracy of the Bible’s prophecies. No other religious writing or religion can compare with evidences such as these. 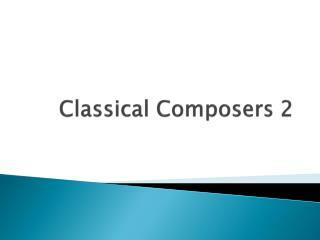 Another powerful evidence of divine inspiration is the harmony between the Old Testament and the New Testament. 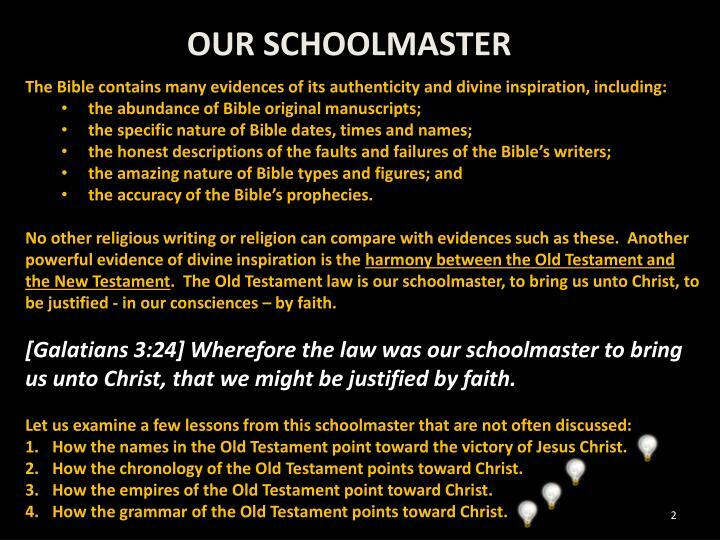 The Old Testament law is our schoolmaster, to bring us unto Christ, to be justified - in our consciences – by faith. [Galatians 3:24] Wherefore the law was our schoolmaster to bring us unto Christ, that we might be justified by faith. How the names in the Old Testament point toward the victory of Jesus Christ. 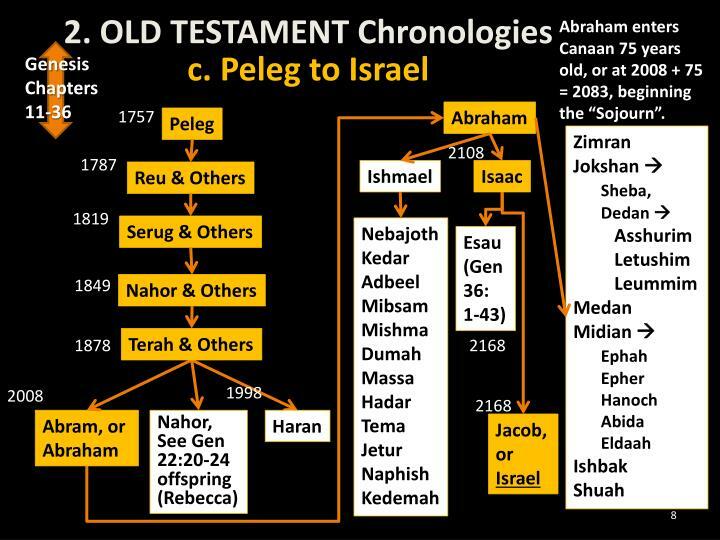 How the chronology of the Old Testament points toward Christ. 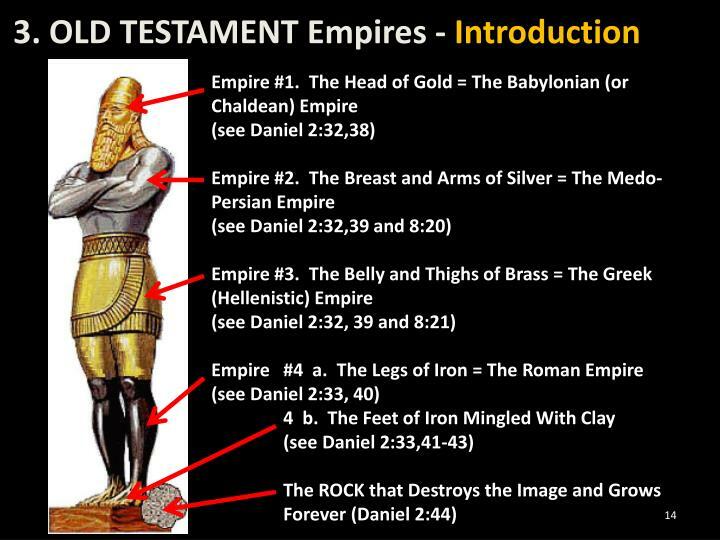 How the empires of the Old Testament point toward Christ. How the grammar of the Old Testament points toward Christ. [Joshua 8:31] As Moses the servant of the LORD commanded the children of Israel, as it is written in the book of the law of Moses, an altar of whole stones, over which no man hath lift up any iron: and they offered thereon burnt offerings unto the LORD, and sacrificed peace offerings. 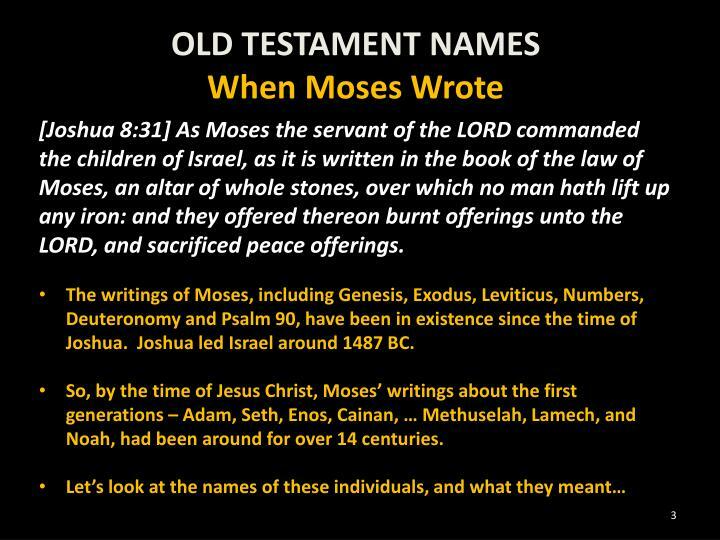 The writings of Moses, including Genesis, Exodus, Leviticus, Numbers, Deuteronomy and Psalm 90, have been in existence since the time of Joshua. Joshua led Israel around 1487 BC. 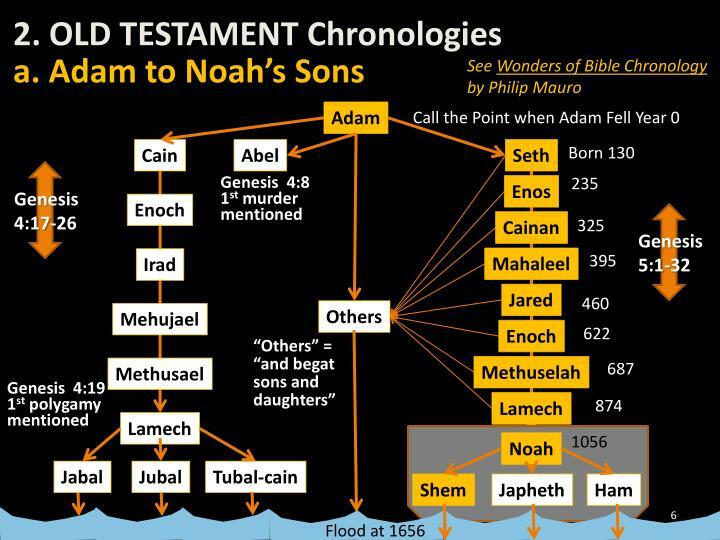 So, by the time of Jesus Christ, Moses’ writings about the first generations – Adam, Seth, Enos, Cainan, … Methuselah, Lamech, and Noah, had been around for over 14 centuries. 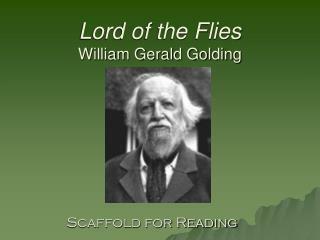 Man appointed mortal sorrow; the blessed God shall come down teaching; His death shall bring (the) despairing rest. was preached – declared the gospel message! From Adam to Israel (Jacob) dates are tracked by age of father at the birth of his first son. 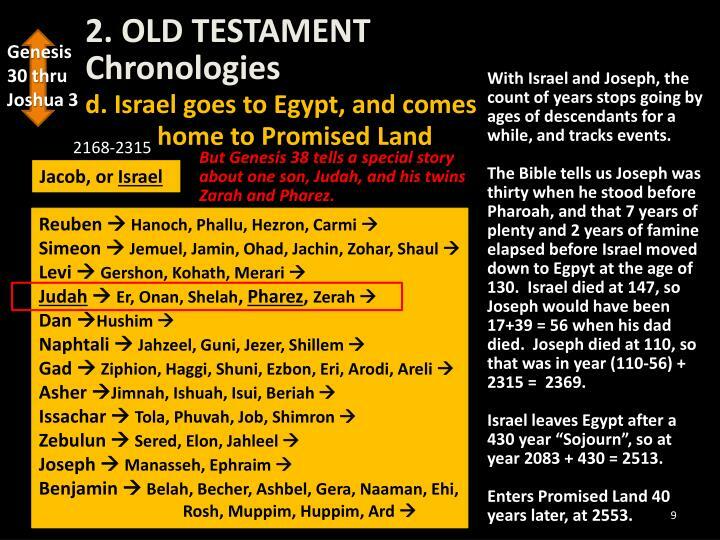 From the time of Israel (Jacob), dates are tracked by the length of stay in Egypt to the entering of the Promised Land. From the entering of the Promised Land, dates are tracked by the rule of judges, and the periods of oppression, until the first king. From the first king until captivity, dates are tracked by the ascension of each king to his throne. 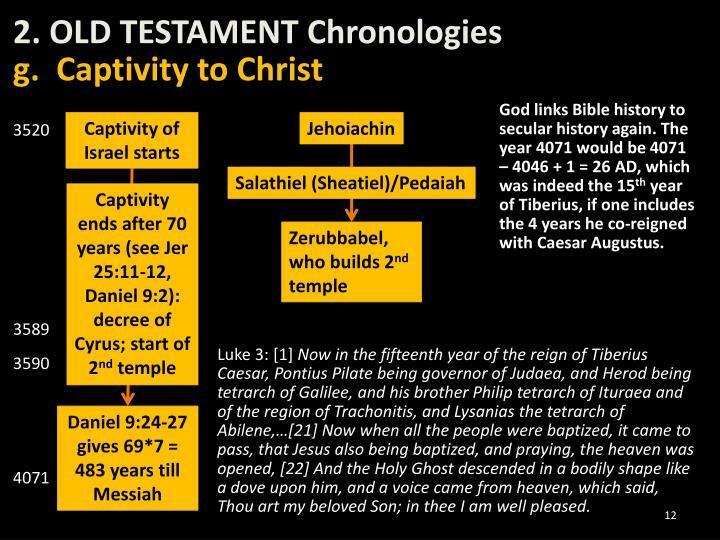 From captivity, dates are projected by the prophets Jeremiah and Daniel to the baptism of Jesus Christ. But all dates can be determined from the Bible alone! Abraham enters Canaan 75 years old, or at 2008 + 75 = 2083, beginning the “Sojourn”. With Israel and Joseph, the count of years stops going by ages of descendants for a while, and tracks events. The Bible tells us Joseph was thirty when he stood before Pharoah, and that 7 years of plenty and 2 years of famine elapsed before Israel moved down to Egpyt at the age of 130. Israel died at 147, so Joseph would have been 17+39 = 56 when his dad died. Joseph died at 110, so that was in year (110-56) + 2315 = 2369. Israel leaves Egypt after a 430 year “Sojourn”, so at year 2083 + 430 = 2513. Enters Promised Land 40 years later, at 2553. But Genesis 38 tells a special story about one son, Judah, and his twins Zarah and Pharez. Israel enters Promised Land, year 2553. Joshua conquers Promised Land and tribes inherit portions 2559 (calculated by the ages of Caleb – from Judah - in Numbers 13 and Joshua 14). Add years given for all periods of oppression, judges, and rests given in Judges and I Samuel to come to year 3023, when Saul began to reign. This adds up to 450 years (as also preached by Paul in Acts 13:18-20). Saul reigned 40 years (Acts 13:21) up to year 3063. 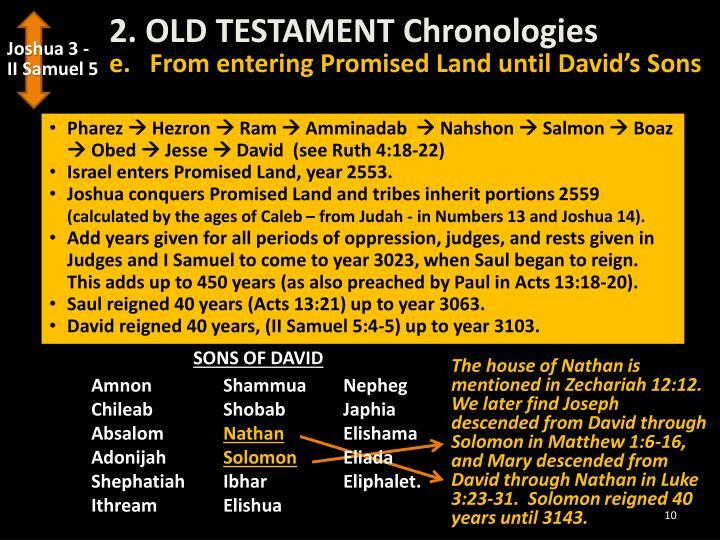 David reigned 40 years, (II Samuel 5:4-5) up to year 3103. The house of Nathan is mentioned in Zechariah 12:12. We later find Joseph descended from David through Solomon in Matthew 1:6-16, and Mary descended from David through Nathan in Luke 3:23-31. Solomon reigned 40 years until 3143. 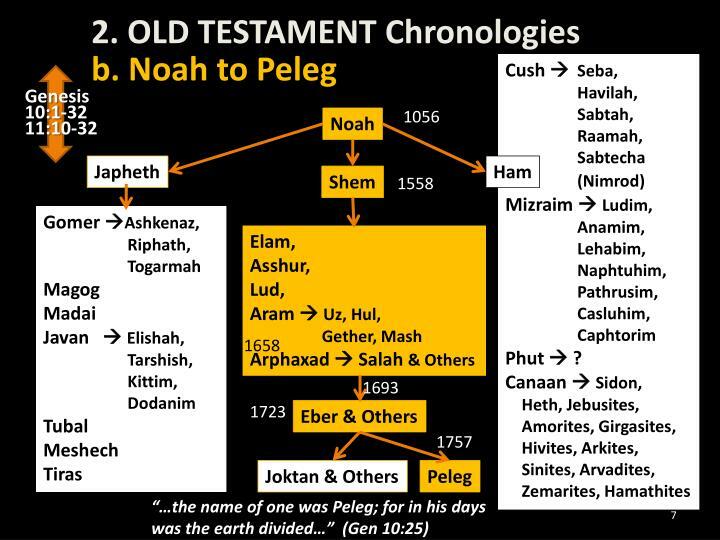 Year 3521 is 525 BC, linking Bible history to secular history. Thus, Adam fell in 3521+525 = 4046 BC. God links Bible history to secular history again. The year 4071 would be 4071 – 4046 + 1 = 26 AD, which was indeed the 15th year of Tiberius, if one includes the 4 years he co-reigned with Caesar Augustus. Luke 3:  Now in the fifteenth year of the reign of Tiberius Caesar, Pontius Pilate being governor of Judaea, and Herod being tetrarch of Galilee, and his brother Philip tetrarch of Ituraea and of the region of Trachonitis, and Lysanias the tetrarch of Abilene,… Now when all the people were baptized, it came to pass, that Jesus also being baptized, and praying, the heaven was opened,  And the Holy Ghost descended in a bodily shape like a dove upon him, and a voice came from heaven, which said, Thou art my beloved Son; in thee I am well pleased. 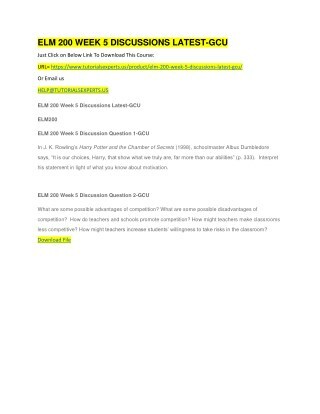 h. So what do these chronologies show us? 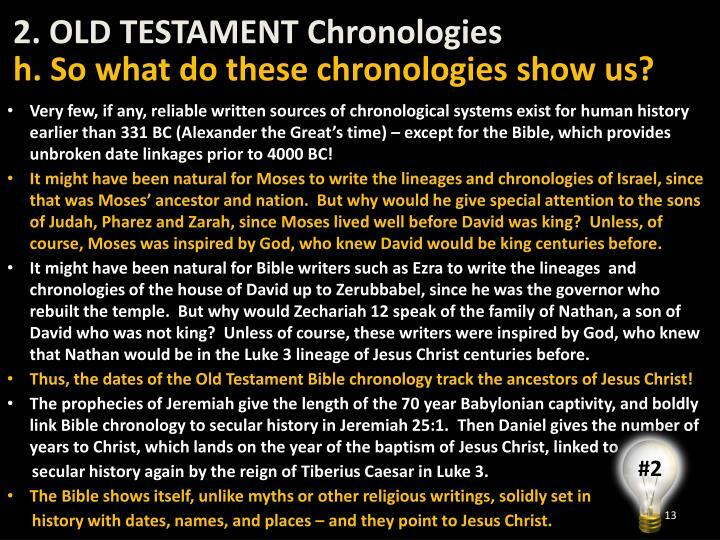 Very few, if any, reliable written sources of chronological systems exist for human history earlier than 331 BC (Alexander the Great’s time) – except for the Bible, which provides unbroken date linkages prior to 4000 BC! It might have been natural for Moses to write the lineages and chronologies of Israel, since that was Moses’ ancestor and nation. But why would he give special attention to the sons of Judah, Pharez and Zarah, since Moses lived well before David was king? Unless, of course, Moses was inspired by God, who knew David would be king centuries before. It might have been natural for Bible writers such as Ezra to write the lineages and chronologies of the house of David up to Zerubbabel, since he was the governor who rebuilt the temple. But why would Zechariah 12 speak of the family of Nathan, a son of David who was not king? Unless of course, these writers were inspired by God, who knew that Nathan would be in the Luke 3 lineage of Jesus Christ centuries before. 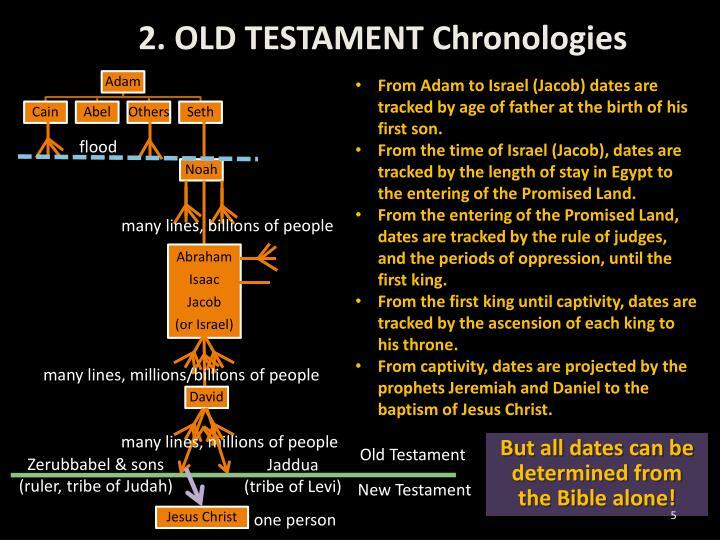 Thus, the dates of the Old Testament Bible chronology track the ancestors of Jesus Christ! secular history again by the reign of Tiberius Caesar in Luke 3.
history with dates, names, and places – and they point to Jesus Christ. 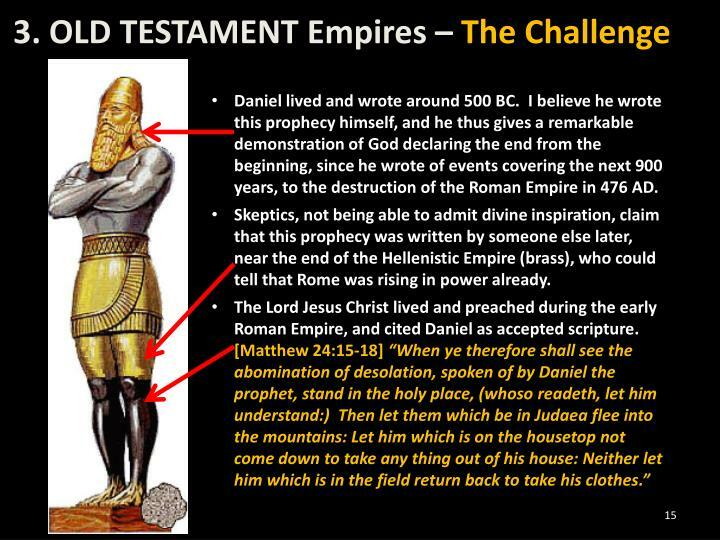 Daniel lived and wrote around 500 BC. I believe he wrote this prophecy himself, and he thus gives a remarkable demonstration of God declaring the end from the beginning, since he wrote of events covering the next 900 years, to the destruction of the Roman Empire in 476 AD. Skeptics, not being able to admit divine inspiration, claim that this prophecy was written by someone else later, near the end of the Hellenistic Empire (brass), who could tell that Rome was rising in power already. Suppose – for the sake of argument – we temporarily assume the skeptics’ notion that Daniel was written in the late Hellenistic period. The Lord Jesus Christ preached (about 26 to 30 AD) in the early Roman Empire (27 BC - 285 AD) and cited Daniel as scripture. The Roman Empire did not become “divided” as described in Daniel 2:41 until 285 AD, when the emperor Diocletian formed the Eastern and Western Roman Empires. The Roman Empire fell in 476 AD. 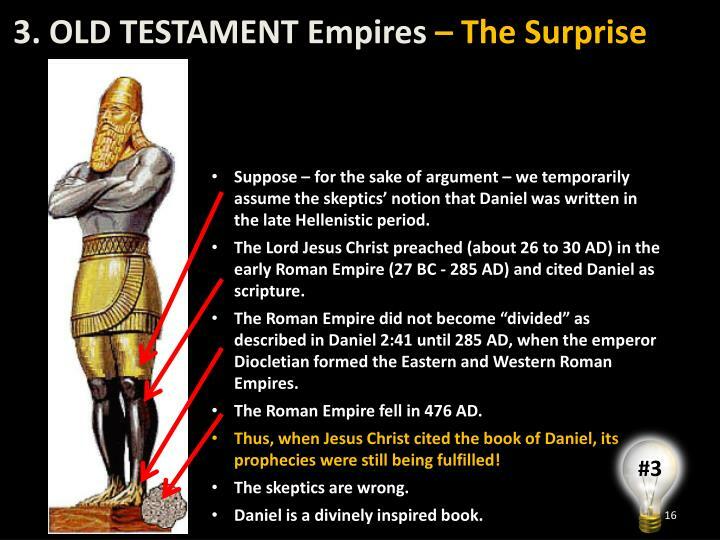 Thus, when Jesus Christ cited the book of Daniel, its prophecies were still being fulfilled! Daniel is a divinely inspired book. Jacob died in 1731 BC. 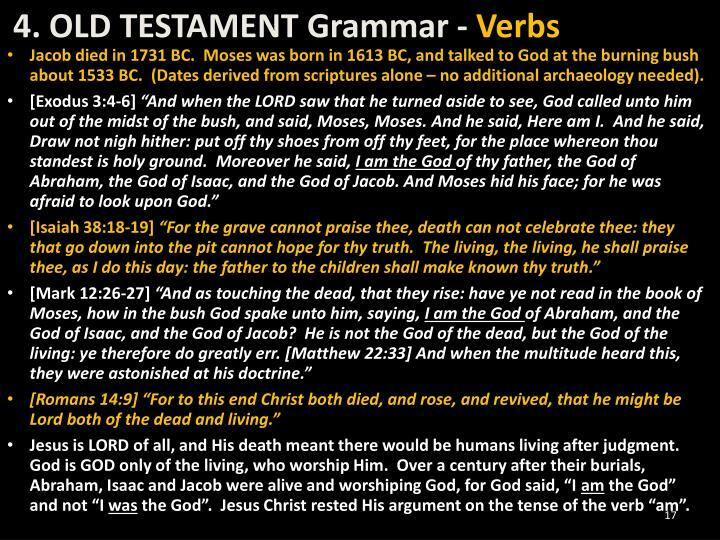 Moses was born in 1613 BC, and talked to God at the burning bush about 1533 BC. 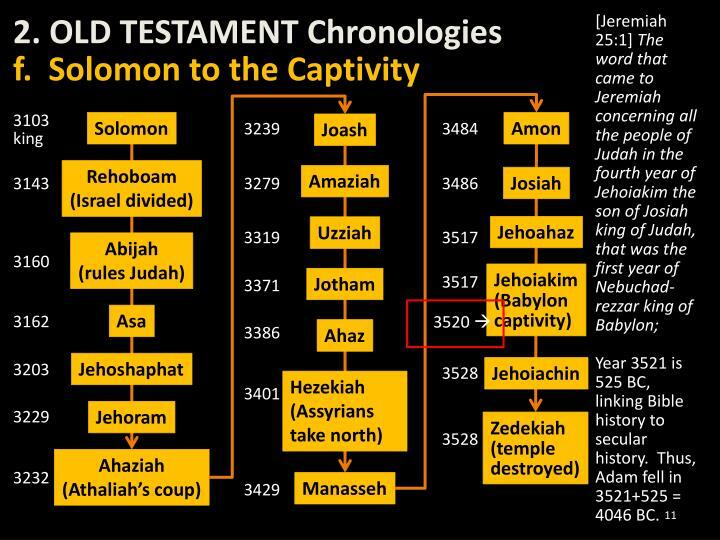 (Dates derived from scriptures alone – no additional archaeology needed). Jesus is LORD of all, and His death meant there would be humans living after judgment. God is GOD only of the living, who worship Him. Over a century after their burials, Abraham, Isaac and Jacob were alive and worshiping God, for God said, “I am the God” and not “I was the God”. Jesus Christ rested His argument on the tense of the verb “am”. Paul, writing Galatians, considered the Old Testament to be inspired to the singularity or plurality of the noun “seed” – and so considered the Old Testament to be divinely accurate, and pointing to Jesus Christ. 4. 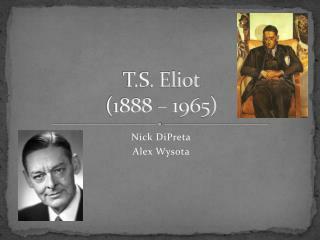 OLD TESTAMENT vs. NEW TESTAMENT? 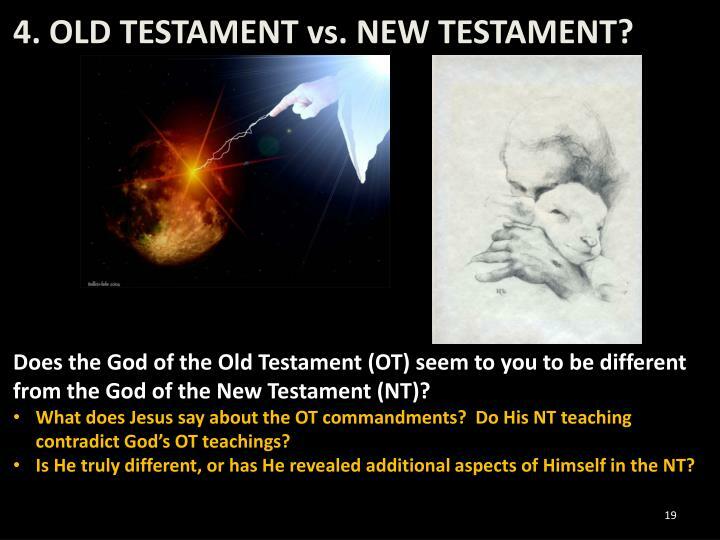 Does the God of the Old Testament (OT) seem to you to be different from the God of the New Testament (NT)? 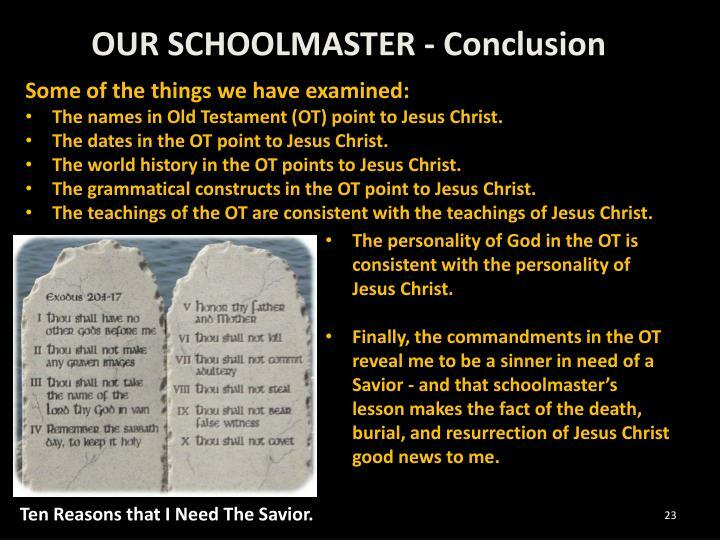 What does Jesus say about the OT commandments? Do His NT teaching contradict God’s OT teachings? Is He truly different, or has He revealed additional aspects of Himself in the NT? 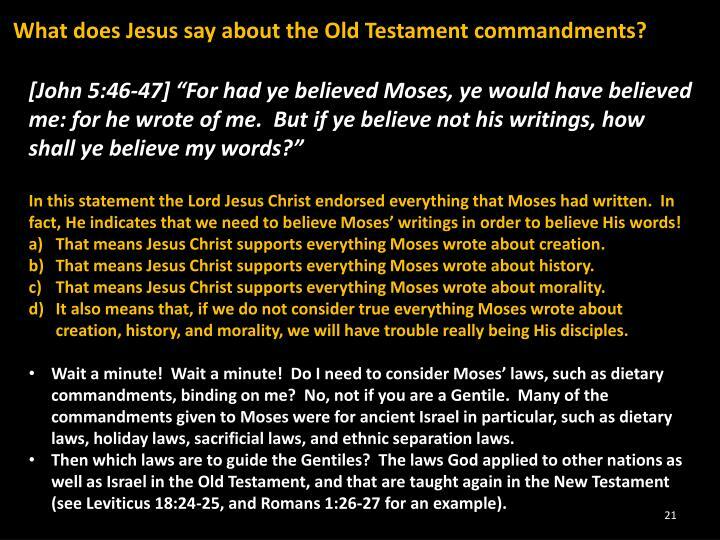 What does Jesus say about the Old Testament commandments? In the Sermon on the Mount, the Lord Jesus did not teach against, “it has been written” – as if He opposed the law. He said, “ye have heard that it hath been said” – and thus taught against erroneous man-made interpretations of the law which were popular in His day. In this statement the Lord Jesus Christ endorsed everything that Moses had written. 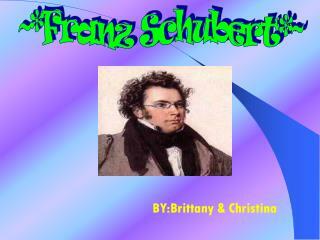 In fact, He indicates that we need to believe Moses’ writings in order to believe His words! That means Jesus Christ supports everything Moses wrote about creation. That means Jesus Christ supports everything Moses wrote about history. That means Jesus Christ supports everything Moses wrote about morality. It also means that, if we do not consider true everything Moses wrote about creation, history, and morality, we will have trouble really being His disciples. Wait a minute! Wait a minute! Do I need to consider Moses’ laws, such as dietary commandments, binding on me? No, not if you are a Gentile. Many of the commandments given to Moses were for ancient Israel in particular, such as dietary laws, holiday laws, sacrificial laws, and ethnic separation laws. Then which laws are to guide the Gentiles? 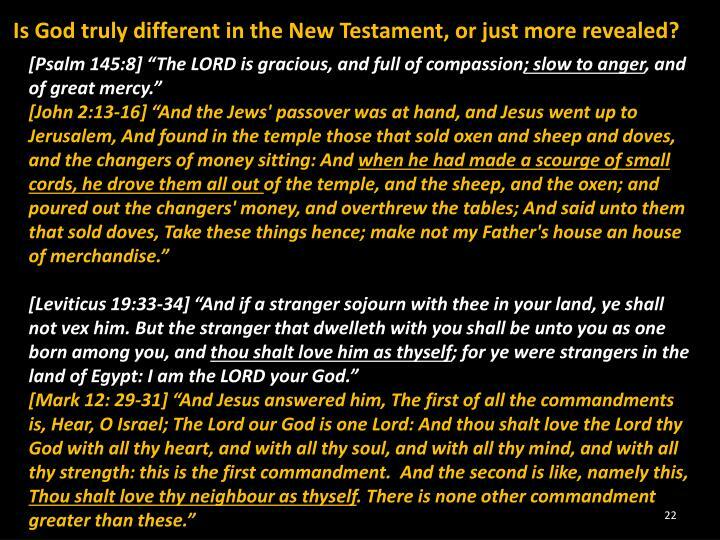 The laws God applied to other nations as well as Israel in the Old Testament, and that are taught again in the New Testament(see Leviticus 18:24-25, and Romans 1:26-27 for an example). Is God truly different in the New Testament, or just more revealed? 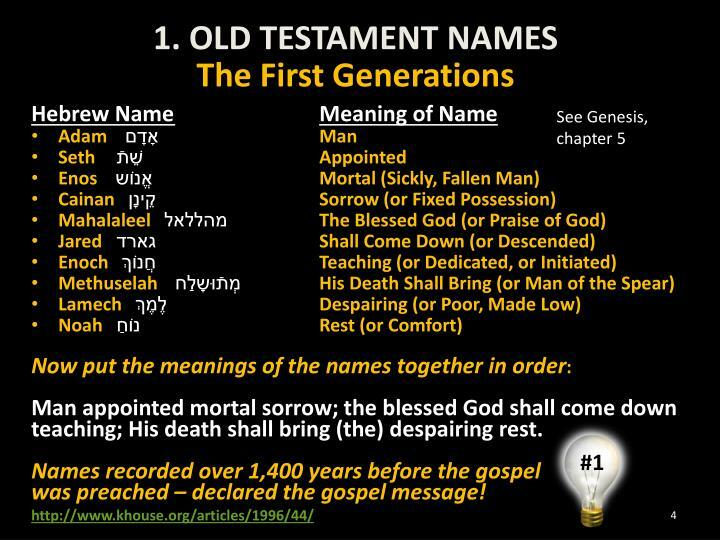 The names in Old Testament (OT) point to Jesus Christ. The dates in the OT point to Jesus Christ. The world history in the OT points to Jesus Christ. 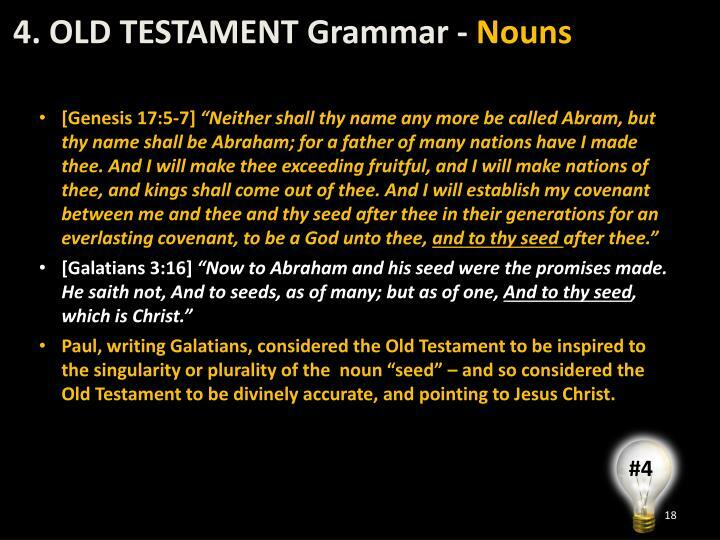 The grammatical constructs in the OT point to Jesus Christ. 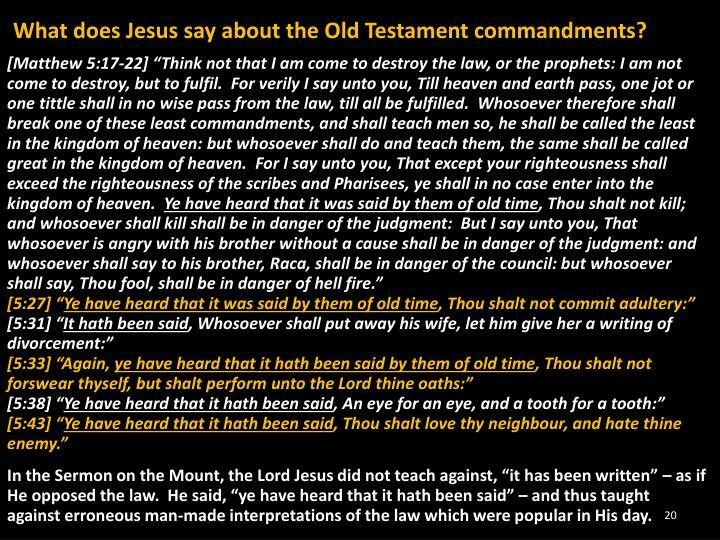 The teachings of the OT are consistent with the teachings of Jesus Christ. The personality of God in the OT is consistent with the personality of Jesus Christ. Finally, the commandments in the OT reveal me to be a sinner in need of a Savior - and that schoolmaster’s lesson makes the fact of the death, burial, and resurrection of Jesus Christ good news to me. Ten Reasons that I Need The Savior. 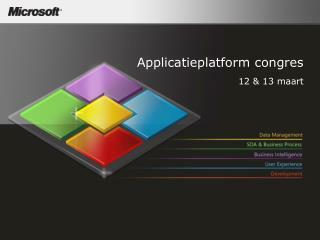 Applicatieplatform congres 12 & 13 maart -Applicatieplatform congres 12 &amp; 13 maart. 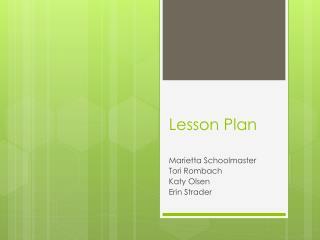 het maken van mooie software op basis van silverlight. 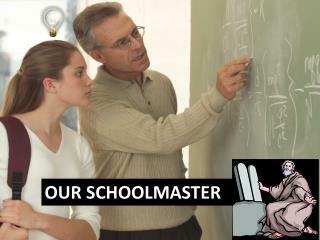 siebrand dijkstra algemeen directeur spd@schoolmaster.nl schoolmaster bv. Caribbean Fish Slideshow # 2 -. 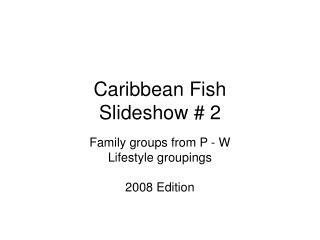 family groups from p - w lifestyle groupings 2008 edition. snappers. snap jaws when hooked by anglers slightly upturned mouths. schoolmaster snapper. silver body all fins are yellow often school juvenile. 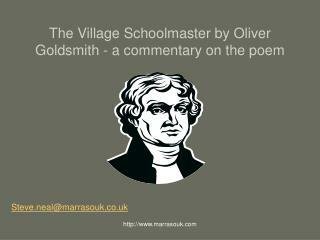 The Village Schoolmaster by Oliver Goldsmith - a commentary on the poem -. steve.neal@marrasouk.co.uk. 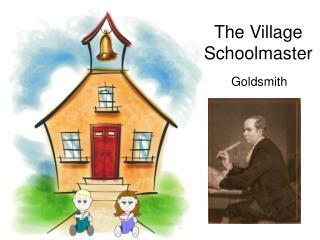 “the village schoolmaster is an extract from a longer poem - “the deserted village.”. the common land was fenced off by the rich.